The Best Guttering Services in Brisbane! If you're looking to hire an AMAZING GUTTERING SERVICE in Brisbane – look no further! OzRoofWorks have been in business for over 40 YEARS, and we're only getting better with age! You might be homeowners or property investors due to update your property with the new gutter installation. Or, you may be architects and builders looking to hire guttering contractors to install up to code gutters in your project. Luckily, we've got experience in all of those areas! Our website will show you the amazing range of projects we've undertaken. This way, you can see for yourselves – we've got the proof to back up our claims. These are all big responsibilities, and we take them seriously. With improperly installed gutters, your home or property may be looking at expensive flooding repairs and insect infestations, as well as cracked foundations. Because these are serious issues, you want to find a guttering service that can deliver on all their promises – and we can. 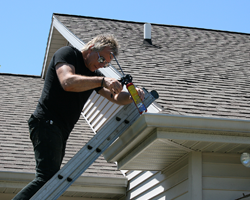 We employ experts who will evaluate the damage to your gutters. Whether it's just a leak or a more serious problem – we'll fix it for you. Our family business is making sure we never let another family down. So, let us take care of you and yours, and call us now. Now, are your gutters the best they could be? If not, call us NOW, and you'll get the LICENSED AND INSURED services of a FAMILY BUSINESS with 40 YEARS OF EXPERIENCE. But how can you even be sure we can even fix your problem? Well, we certainly can, as we offer anything from GUTTER REPLACEMENT and REPAIR to BOX GUTTER REPLACEMENT SERVICES! You can also get a FREE ROOFING ESTIMATE with us! 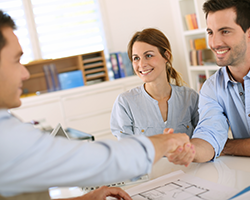 So, don't waste time on waiting to call us – your property may depend on it! How can you even know if the time has come to replace your gutters? Well, you can call us immediately, just to check. Otherwise, there are some telltale signs of a gutter that's about to turn on you. if the pieces that used to hold your gutter together seem to be missing… you might have a problem on your hands. 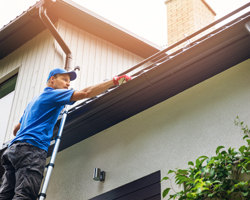 if parts of your gutter keep disconnecting and causing leaks, repeatedly and despite your efforts to repair them, we're here to help. despite frequently hammering them back into place, your gutters seem to pull from the roof? It might be time for a replacement. these will cause the water to pool in one area instead of continuing on its path down the gutter system. if the board holding your gutters up gets too stressed as a result of having to hold up a gutter that doesn't drain properly, you may need to call in reinforcement. many insects love the environments that the unmoving water in your damaged gutter and the soaked wood provide. If you see white ants or more mosquitoes than usual – call us. if you already see these signs, that means that water has been pouring over your gutters frequently – this shouldn't be happening. Call us to see if you need repairs or replacement. sometimes, these can be fixed with simple repairs, but too many cracks may be a sign that it's time to replace your gutters. if your plants seem to be a bit worse for wear after rain, they may be getting more water than they signed up for. Also, some of the ground may be pushed down because of the weight of the water. 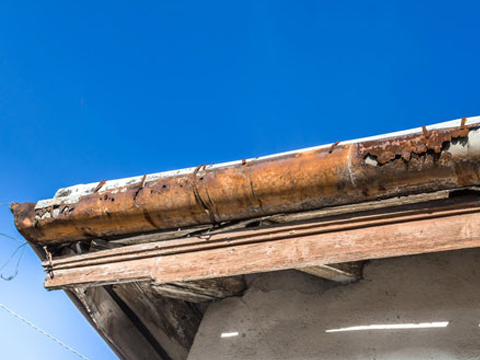 these are some of the most dangerous signs of a bad gutter, and this is why you should call us if you notice any of the signs above immediately. If things get so bad that you get foundation damage, you may be looking at incredibly expensive repairs. Don't worry, though. If you end up needing a replacement, we can be in and out within a day or two. We'll take your old gutter to a garbage disposal site where the parts can be recycled. Luckily, a lot of the signs we mentioned can be helped with just minor repairs, if you call OzRoofWorks in as soon as you spot them! And if you're not sure of what you're seeing, you can call us to get a FREE INSPECTION! Any of these problems may have easy solutions if you notice them on time, so make sure you're checking your gutters for damage periodically. But if you find that any of these issues, as well as those listed in the previous section, are just everywhere on your gutters, you may have waited too long to get repairs. If you've got the following issues, you might be looking at a replacement. So, go ahead and check your gutters for these problems. If you don't think you can check for them yourselves, or you may need a second opinion, remember that you can always call us to inspect your roof, free of charge! 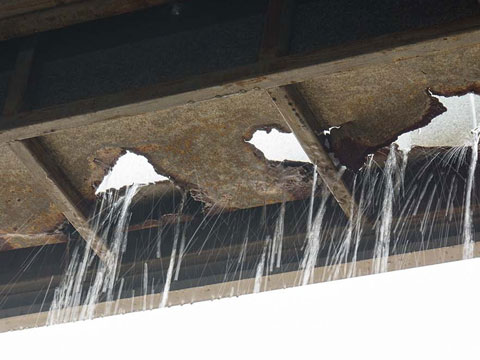 If we find minor problems, OzRoofWorks repair services can easily handle leaking gutters. We can even deal with repairs to the fascia board that holds up your gutters. In the worst case scenarios, we'll offer a full fascia restoration. That service that comes with a paint job that will bring your home a spark of new life. If we can react to minor issues on time, you'll be spared the expense of a gutter replacement as well as water damage repairs. If you're the owner of a commercial building, you might be looking into box gutter replacement that will be done SAFELY and WITHIN LEGAL BUILDING CODES. Fortunately, OzRoofWorks has plenty of experience with those, and we're always keeping our eye on new regulations so that we may answer them in the best way possible. Commercial building gutter regulations are, of course, different than those of residential housing and you'll need a team that understands that on your side. We've worked with all types of gutter materials, including steel, aluminium of various thicknesses, and copper. There are different reasons a commercial building owner may opt for each of these, which we will explain to you so that you can make the best choice for your property. As a commercial building is larger than a residential home, it might be more difficult to keep track of the condition your gutters are in. That's why you may even completely forget about them until it's too late to save them. At that point, the repair and replacement expenses are too much for you to handle. OzRoofWorks will work with you to make sure that never happens. 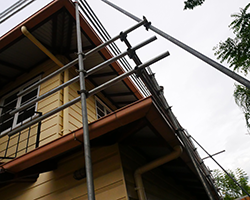 We will ensure there is no flooding and water damage to disrupt the businesses in your commercial building by giving you the BEST BOX GUTTERING SERVICES in Brisbane! Call us NOW, and we'll give your building a CHECK-UP FREE OF CHARGE! And if you do choose to trust us with your commercial building's box gutters, we can be all done with the repairs and replacement within two or three days, depending on the weather. So, you can have a completely new box gutter installed within a week! Your business will be safer, and it'll potentially save you the water damage expenses you could have with your current gutters. We'll send our experts out to evaluate your current gutter system. We'll also get your input on what you're looking for in your gutter system, and any concerns you might have. Once we have sorted all of your questions out, we may start prepping for the work. During this part of the procedure, we deal with paying for insurance and setting up safety precautions. These will ensure the safety of the trained professionals who will be working on your gutters. Additionally, you and the people employed in your commercial building may rest easy knowing that everything will be done according to all safety regulations. 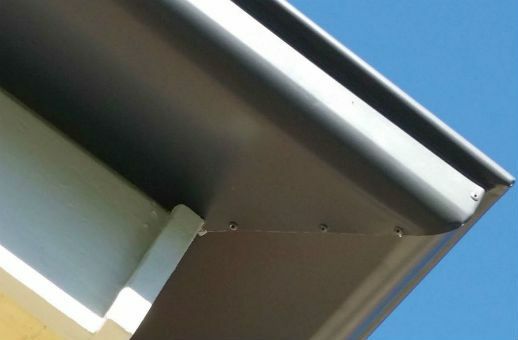 the installation of colorbond or zincalume steel guttering can commence. We will install materials based on your preference. And since we're always keeping up with local regulations, you can be sure that everything will be UP TO THE CURRENT BUILDING CODE. we stay with you even after we finish the installation! We take care of SITE CLEANUP and QUALITY CONTROL so we can all be certain of a job well done. First, our experts will perform quality control checks on your newly installed box gutter system. We will then dismantle the safety precautions we previously put up, and your building will be as good as new! And there we go – you could have your whole box gutter system replaced within a few days. So, what are you waiting for? Give us a call, and we'll set up a consultation as soon as possible! So, ARE YOU looking for a guttering company in Brisbane? We've seen the kind of problems that can happen when people fail to spot gutter weaknesses on time. If you want to protect your home or commercial building from water damage at least, and serious structural damage at most, why not try OzRoofWorks? We've been committed to fixing roofing and guttering problems for generations. In our family business, we like to say we are "small enough to care and big enough to deliver" – and it's true. If you go with our guttering services, you'll be working with a TRUSTED BUSINESS that works with TRIED AND TESTED METHODS and keeps up with new building regulations. With 40 YEARS OF EXPERIENCE in metal roofing behind us, we've seen and done it all. We're confident that we can give your building the gutters it deserves. If you go to our site, you'll see a lot of other projects we've worked on. You can even see videos that show how our efficient team of professionals do it! Whether you're an architect looking for guttering and roofing contractors, or a property owner looking to prevent water damage, we can handle anything you throw at us. As we said, OzRoofWorks is a LICENSED AND INSURED company. We offer a 30 YEAR PRODUCT WARRANTY as well as a 10 YEAR WORKMANSHIP WARRANTY. If you want us to get to fixing your roofing problems, CALL NOW! And if you're still not sure if your property suffers from any of the issues we listed, that's alright! You can sign up for a FREE ROOFING AND GUTTERING ESTIMATE on our website. We hope to see you (and your gutters) soon! Thank You For The Opportunity To Quote on Your Project ! One Of Metal Roofing Experts Will Be In Contact Shortly.